I haven't tried it, but this might work. Oh I doubt they care. You can probably find the names here on the site anyway. 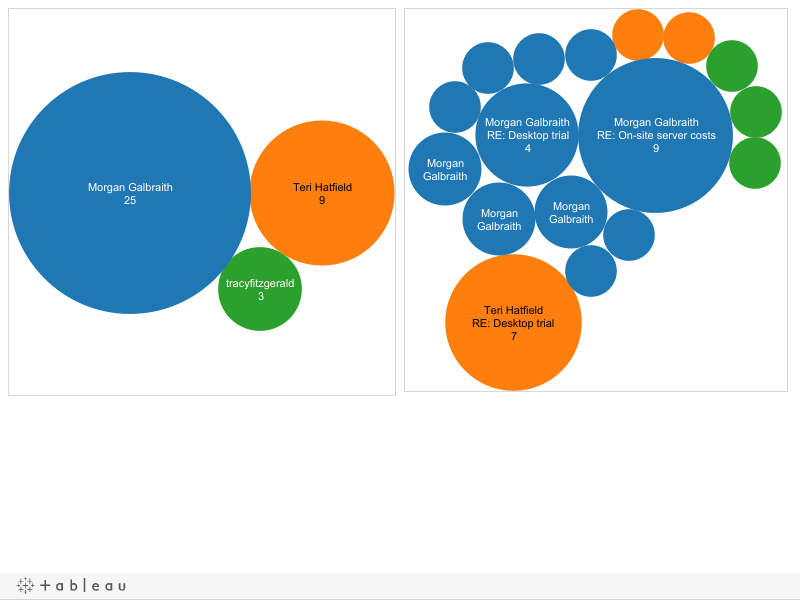 I was just impressed that Tableau parsed the sender names and stuff. Didn't grab the contents of course but it's still an easy way to visualize your inbox. You can add numerous additional columns to your current Outlook view, and these will all show up in the copy/paste data. You can perform complex searches in Outlook and copy/paste the search results in the same way. This is a useful way to capture sent and received emails regardless of the folder they reside in. Copies of the same email placed in multiple folders can lead to double-counting. Emails addresses in the fields To, From, etc. may optionally have surrounding single quotes. Strip these away to ensure consistency with unquoted versions. Semicolon-delimited fields such as To, From, etc. may represent multiple values within a single cell. There is no facility in Tableau for working with such nested data.